Suspend Costlocker users to save money on those, who don't need to use it. In either case, deactivating a person will result in their inability to log in to Costlocker. However, their data (timesheets, costs, etc.) will be retained in all projects. Select People on the top bar, then click the name of the person to be deactivated. Continue by clicking the Deactivate Person button. A pop-up window will appear, informing you about what will happen after deactivation. Just confirm the deactivation by clicking the Yes, Deactivate button. If you have subscribed to Costlocker, you’re paying for a certain number of people 30 days ahead of time. That’s not a problem: if you deactivate a person, this will remove them from your monthly subscription and transfer the budget for the remaining days into credits. These will be spent next month, making you pay less. Example: Let’s say that your subscription is for 10 people from April 5 to May 4. You pay $9 per person even if you fire someone during this period, say April 25. However, we’ll count the days from this date until the end of the period and transfer the remaining budget for the fired person into credits – say $3.45. We’ll even send you an e-mail about how much we’ll be transferring into credits. 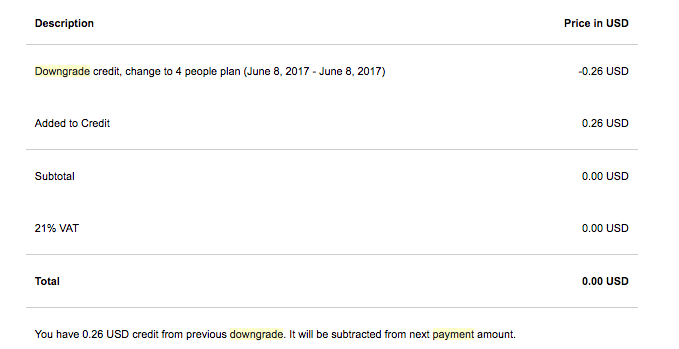 When the time comes to charge you for the next month, we’ll subtract the credits from the previous period (see the Paid from Credit line). As soon as you deactivate a person, click your name in the upper right corner of the screen and select Payments & Billing. You’ll see how many people you’re paying your Costlocker subscription for. Click the minus sign to reduce your subscription by one person. Don’t forget to save the changes. We’re currently working on fully automating this process, so that the Payments & Billing settings get updated automatically after deactivating a person. A deactivated person can be activated again at any time. Simply go to the person page and click the Re-activate Person button. From that point on, that person can log in again and use Costlocker as usual. At the same time, your card will be charged for this person’s subscription.